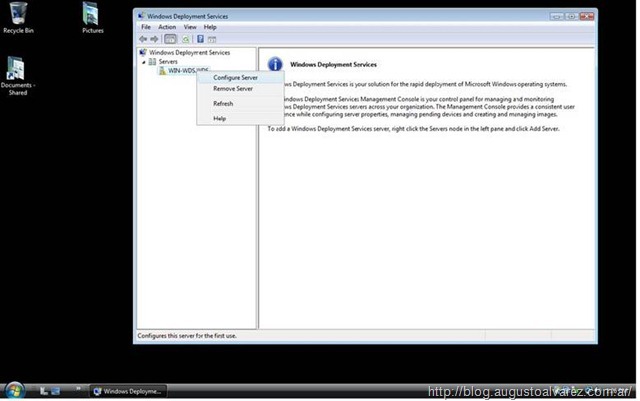 We had a good look about the possibilities about Windows deployment; regarding Windows 7 we’ve completed a guide using Microsoft Deployment Toolkit 2010 (MDT 2010 beta) to capture and deploy unattended installations of Windows 7 with Office 2007 (Post I, Post II and Post III). 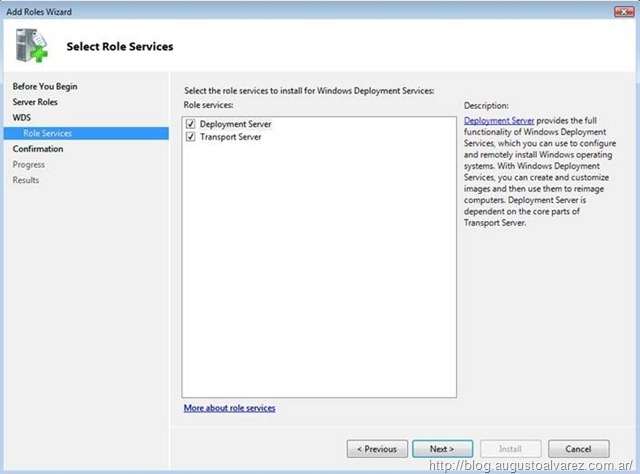 Also we’ve reviewed how to implement unattended installations of Windows Vista using Windows Deployment Services (Post I, Post II and Post III). 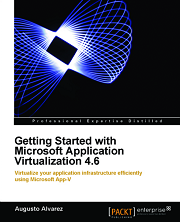 But we didn’t take a look about deploying Windows 7 using Windows Deployment Services (WDS). Now we have a good chance to do that, providing a simple step by step procedure. Deploying operating systems using technologies like Microsoft Deployment Toolkit 2010 or even System Center Configuration Manager are far more scalable that we can offer using WDS. But there’s always the cost/benefit analysis we should take before deciding to use always the most scalable and dynamic technology available. Having a robust platform for deployment requires, as always, bigger costs for maintain it; and if there’s no trade off which we can see it in the short term, why bother? Example: We are using one operating system image as a baseline for our branch office with around 15 users; and we usually have to deploy one operating system to users per month. Should we need to allocate considerate hardware and efforts to maintain MDT or SCCM? Probably those technologies will be far more expensive than just using a simple one or even manual deployments. 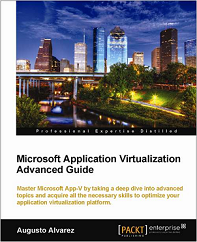 Windows Deployment Services is a simple and straight forward technology to achieve fast and unattended deployments. Just loading a WIM file and the operating system is available over the network. 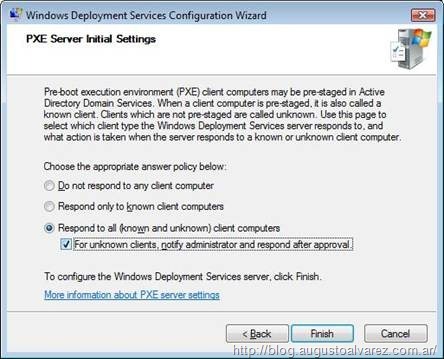 So, let’s take a look about a simple step-by-step process to achieve unattended deployments of Windows 7 using WDS. 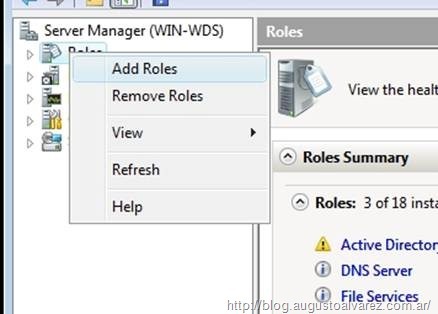 1.1 Installing WDS in Windows Server 2008 is quite simple, just add it as a Server Role from Server Manager. 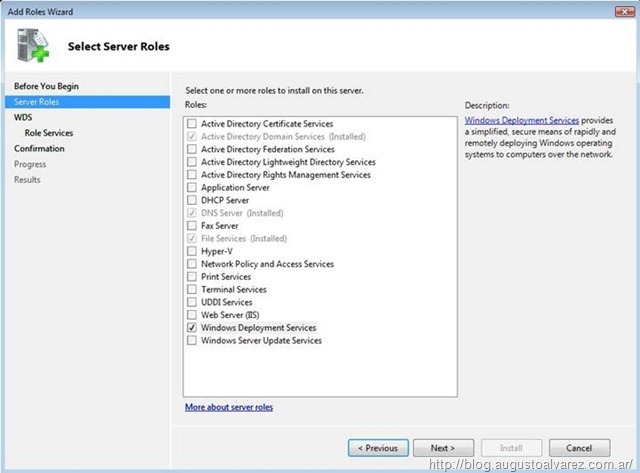 Besides the core components in WDS, Windows Server 2008 has the multicasting feature for the deployment. Transport Server option gives us that functionality. 1.2 Click on next and then Install. WDS also has a simple procedure to configure the server, just running a wizard and you’ll be good to go. 2.1 In Administrative tasks open the WDS up in mmc, expand “Servers” then right click on the root name, and “configure server”. 2.2 We’ll need to create a path for the storing of our images. E:\RemoteInstall. 2.3 PXE answer policy, every time a machine boots from the network you can decide if they are going to receive an automatic answer or wait for an administrator decision. 2.4 Uncheck “add images now” select next. 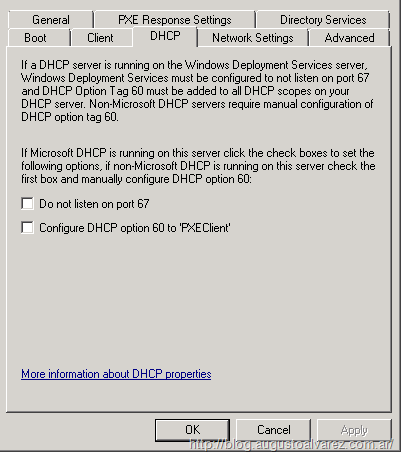 If we have the DHCP server on the same operating system running WDS, we’ll also need to access the WDS server properties and select on the DHCP tab both options: “Do not listen on port 67” and “Configure DHCP option 60 to ‘PXEClient’. In our case the DHCP role is placed on a different server and those options are not checked. Every environment we are trying to deploy will always need boot images; fortunately we just have to select the boot images included on Windows 7 DVD. 3.2 Using a Windows 7 DVD, we can easily find the boot.wim file in “sources” folder. 3.3 Now we can leave the image name to its default or we can change it. 3.4 Confirm settings then continue. 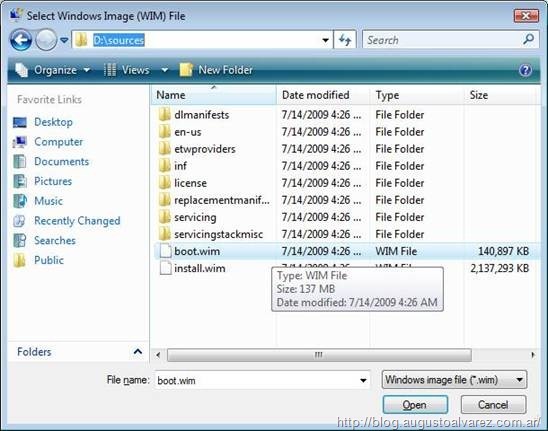 For adding the Windows 7 operating system image is the same procedure to run, but using the “Install Images” folder in WDS console. 3.5 Adding the default Install Image Right click on Install Images in the WDS console and select Add Image. 3.6 Creating a new image group. 3.7 Browse again in “sources” folder and select install.wim. 3.8 Now we are given a choice of all the available versions of the installation media; install.wim contains all the versions available of Windows 7. We can select just one version to avoid allocating unnecessary space in the hard drive. Once completed we’ll have available a boot image, plus a default and clean image of Windows 7 to be installed over the network. There’s an important note regarding boot images; to capture a Windows 7 operating system that you’ve already deployed, you’ll need to create a new media set of this boot.wim file. 4.1 Add a new boot image, the same procedure shown above. Open up the WDS console and right click on “boot images” and select “add boot image”. 4.2 Change the name, and description to identify which image is for booting and for capturing; click on “Finish”. Once the wizard complete, we’ll see the image added to “Boot images”. 4.3 Now select the image name right click, then select “Create Capture Boot Image”. 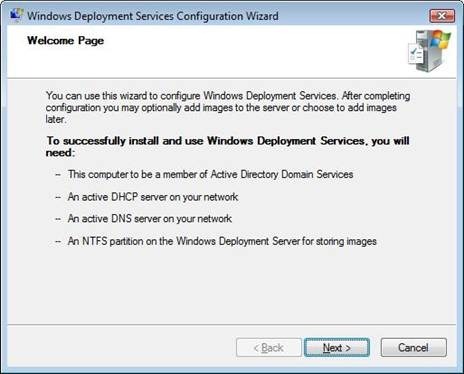 To deploy a customized image of Windows 7 using WDS we must capture it first from an already deployed image. An operating system by default is not ready to be captured, before doing that we must prepare the image. 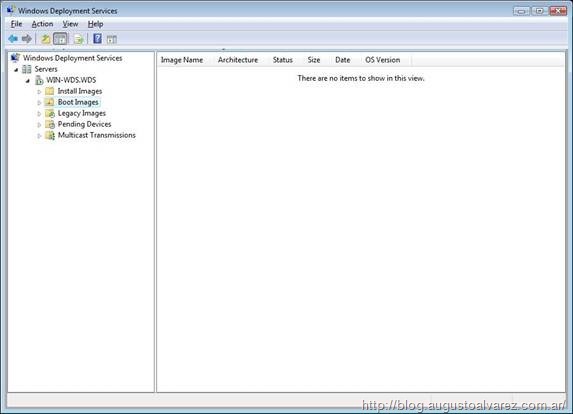 Sysprep is the tool in charge of removing all the particular components in an installation (computer name, SID, OS product key, etc) and makes this image suitable for capturing. 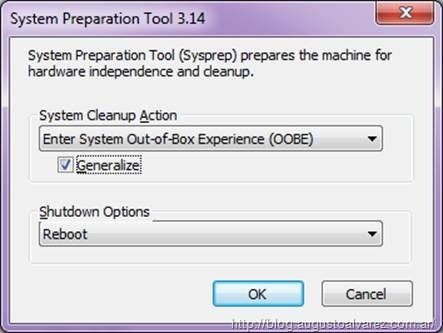 5.1 We can find sysprep tool in “C:\Windows\system32\sysprep”. Running sysprep.exe will pop a simple GUI, where we can select the options OOBE, Generalize and Reboot after completion. We can also use the command line: “sysprep /oobe /generalize /reboot”. Once selected, we’ll see a process running that is going to take a few seconds and the following reboot. 6.1 After sysprep has rebooted our reference machine, boot from PXE network boot, using F12. The computer will require for an IP address to the DHCP Server which will redirect it to a Boot Server available on the network, in this case WDS. After finding it, it will require a second F12 selection. It is important to note that if we missed this sequence, we should reboot the machine as soon as possible. 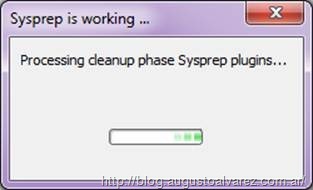 If Windows operating system starts, the sysprep clean up performed earlier will be lost and you won’t be available to capture the image. 6.3 After this we’ll see the WDS wizard, select next. 6.4 Now select the volume to capture, C:\, and create the image name file. If we don’t see any volume available to capture, is because the sysprep process did not completed normally and we must run it again. 6.5 Now we will see the screen asking you where to store the WIM file. Select “upload Image to WDS server”, providing the IP address or FQDN. It will also require domain credentials to access the server. 6.6 Select the Image Group you’ve created to store the image. If you don’t have any group created in WDS, you’ll receive the error of no group available. Now the WDS will create your custom reference image of your client machine. The process usually takes a while, depending on the operating system characteristics you are capturing. On the next post we’ll see how to create unattended files with some examples and deploying a this captured Windows 7 image in a full unattended process. I am having an issue capturing my operating system after a sysprep. When i boot into WDS, it is only the d: (DVD ROM), and it does not list c:. I am not sure if this has to do with creating a new media set of the boot.wim file and sure I understand how to do that or what do. Please Help!. The new “media set” for boot.wim is actually the option when you select “Create Capture Boot Image” in the WDS Console; nothing out of the ordinary. Regarding the error you mentioned, I think it could be related to a corrupted WIM file, did you try saving the WIM file locally in the client machine and then upload it to the WDS manually? I have not tried to upload it manually. How would I do that? Would I just copy the wim file on the local computer to the wds server and place it in the images folder or is there a special process that needs to be done to upload to the server. But on a second note all my windows xp images are working fine. I have actually reimaged the machine and am going to try and capture the image again tomorrow. I don’t understand why would I need to create a new capture boot image if the machine had already been imaged? Is that causing the issue? You don’t need a capture boot image if you already have captured the images. To upload an image manually you have to move it locally to the server, and using the WDS console you can select the option “Import Image” and add it from the WIM file. Thank you for your tips. Very useful! So, now a have a question. Do you have same experience with migration of users documents and settings? So i should choose the boot.wim originally from the source cd or i should create another boot.wim for the capturing image part. i’ve tried to choose back the same boot.wim in the source cd, but it just wont goes into the WDS capturing wizard. You have to convert the boot image into a capture boot image. Take a look to the step 4.3: Now select the image name right click, then select “Create Capture Boot Image”. I have created a deployment share and added all the appl,drivers along with OS in MDT 2010.For that i have created a database and task sequence for the appropriate one.Also am not capturing the .wim .I am deploying using WDS server throug boot .wim(Network).After installing OS and all applications but the admin users are not adding to the admin group…kindly give a solution on this.. Thanks for your guide Augusto. When I deploy one of these images, it comes down with the user profile that was used to create it. When I ran Sysprep on XP it always deleted the user profile. Do you know how I can do it on Windows 7 to ensure that the profile is deleted and the image comes down “clean”? You will need to delete the profile folder after you captured the image; you can do this with IMAGEX tool. You can mount the WIM file into a directory, delete the folder, dis mount the WIM file and add it again to WDS. Do you have instructions for doing that (mount, IMAGEX etc) or can you point me to some good ones online? 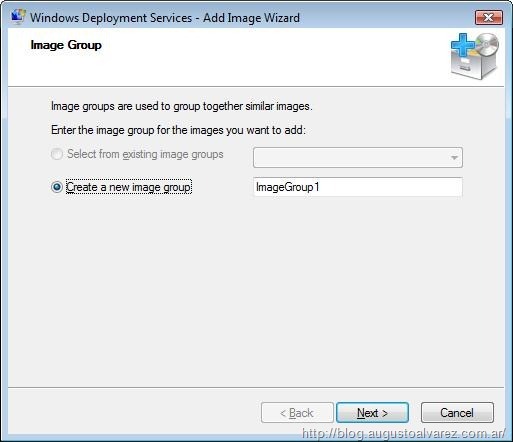 I have been following the instructions for capturing a windows 7 image, however when I get to step 6.6 when I select my image group I can’t click next – it remains greyed out. Do you know why this could be? I have the same problem as you did with the NEXT button greyed out. How did you fix this? was it a setting on the WDS server? I just figured this out, to enable the next button, you’ve got to browse a location to save the image locally using the browse button as well as uploading to the WDS server. i am now building a system with 3 servers. 1st ads, dhcp, dns; 2nd file, print; 3rd wsus, sql and wds. the last 2 servers are only member servers. i had no chance to bring up the wds service to run. i did get an different error everytime i tried something to solve that problem. io even placed the dhcp on the 3rd server but no chance. now i decided to keep dhcp on the ads/dns/dhcp server and put wds also on it and now it runs without a problem. do have an idea what is going wrong in my first wished system? There is 12Gb free on the WDS server drive. I’ve used an admin account to connect to it. so where should be the problem ? The size of the file depends on the image you’ve captured. Did you try using a different network path to store the WIM file? Also a local path can do the work. Can I just upload an already captured image? My question is in 3.2 can i just browse to my already captured image? at your earliest convenience can you please tell me whether i can upload my already captured image into WDS instead of creating and capturing a new image. 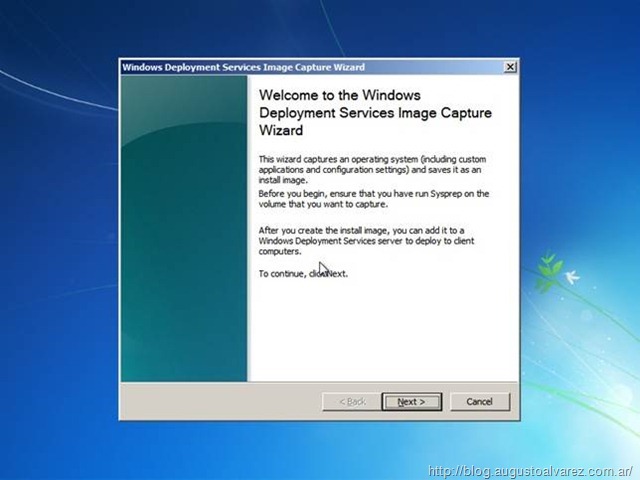 In step 3.2 of “Deploying Windows 7 Using Windows Deployment Services (WDS) part i” your documentation shows how to create a new capture image. Is it possible to broswe to an already captured image? I have created a standard image and want to deploy it using WDS, I don’t want to make a new capture image. How can I deploy the captured image I have already made using the rest of your awsome tutorial material? Thanks for your comments, the process for adding an already captured image are the same when we add a normal image. In this post, in the section “3. 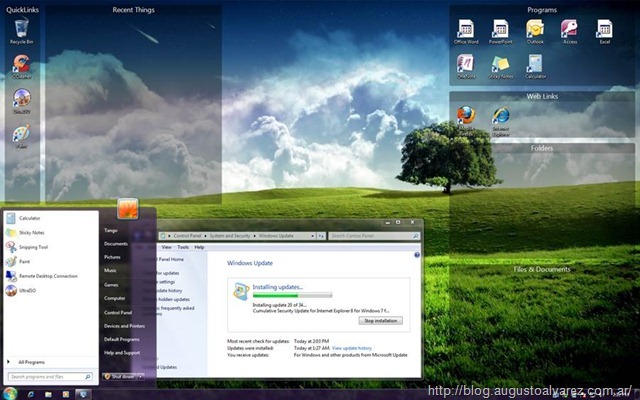 Adding Boot and Default Windows 7 Images” you can see the process. if I follow all of step “3. 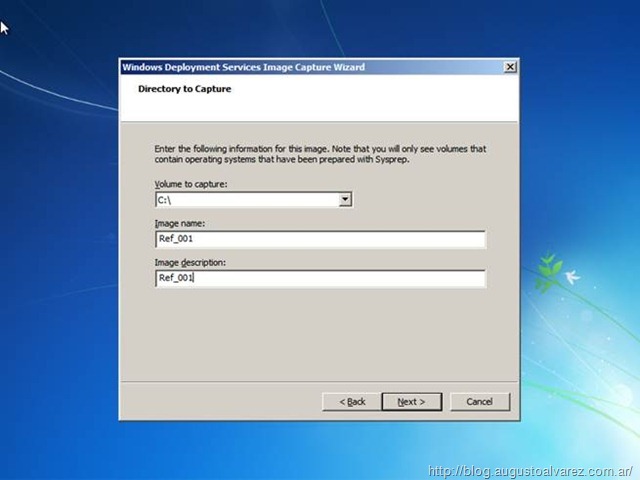 Adding Boot and Default Windows 7 Images” I will have to go through the process of sysprep, but my image is already syspreped and generalized (therefore my image is already a boot-image). an image can become corrupted if you sysprep an image that is already syspreped. and go to step 6? Can you make a tutorial of how to inject drivers? I always get to a screen where is said that the network card drivers are missing. I can not boot my desktop into PXE after I pressed F12. Is there any reason for that? I have finished steps 1,2,3 & 4. There could be many reasons, can you tell me the exact error showing in your screen? Thank you very much for your reply. Also a late Happy New Year to you. There is no error message. I have a server 2003 running WDS without any problem(it was setup by the guy who worked here long time ago and I do not have any documentation for it). I can just plug a desktop(laptop) into a network cable and press F12 when started, it will ask me to install/capture an image. However, now I just set up a 64bit 2008 R2 and set it up following steps 1,2,3&4. I did not add any install image(step 3.5 — 3.8) as I have done step 5 seperately. As this is a new clean WDS, I have injected one nic driver into it using WINAIK, this is the nic driver of the laptop that I want to deploy win7 on it. The boot image I used is on the WIN7 multi license media. After I started the laptop, it could find its own MAC address then waiting for the DHCP to assign an IP address but for around 30 seconds, it boots into windows straight away. Currently do you have two WDS servers in the same network? There should be only one, which will handle all PXE requests. The client machine is in the same network segment as the DHCP and WDS? DHCP is working properly? I stop the WDS on 2003. DHCP is working properly. And the client is in the same network as the DHCP & WDS. DHCP is running on another server (2003) without WDS on it. I just added 08 into the existing network(2003) for 2 days. Please verify the second link and confirm if any of those options are not appearing in the DHCP server. If everything looks normal, I would recommend uninstall both WDS servers, restart DHCP service and then install only one WDS properly. I think everything looks normal. The reason I want to keep the existing WDS is it is 32bit and it has lots of old images which I am still using on it. Then I want to deploy 64bit win7 so I have to set up the new WDS. You do not think simply stop the first server will do the trick? If I start the old WDS, the client will boot into it without any problem at the current stage. You can easily export the images in the “old” WDS, access the console, right-click on each image and select Export. 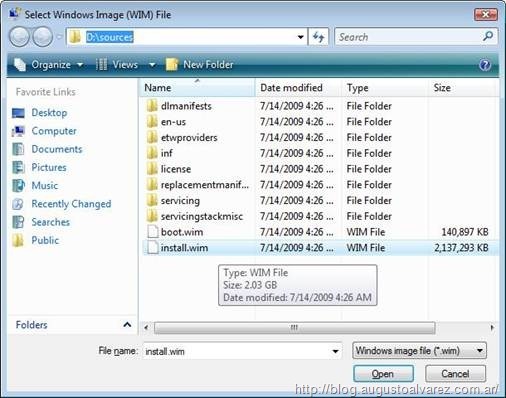 The WIM files can be placed on any folder, and then imported back in any other WDS. My new WDS server is based on 64 bit and the old WDS is based on 32 bit. I found that I can not capture a 64 bit image on a 32 bit OS and vice versa. Is there any walkaround for this? You can capture and deploy both 32bit and 64bit images from a single server, I do so where I work frequently. The trick to doing so is you need 32bit and 64bit boot and capture images on the WDS Server. (Mine were generated from 32bit and 64bit Windows 7 Media respectively). Hi Augusto and thanks for sharing! Unfortunately I have run into trouble that I have absolutely no clue of how to remedy, I hope so much that you have the time to help me out. I managed to follow the steps through installing the server, and for capturing images from a reference computer (a brand new Dell Latitude E6410) but I come no further than step 6.2 (running Sysprep and then reboot the client). Comments on the first line; 2 is the boot index number. The number indicates that image number 2 is marked as bootable and that the image is to be updated. Another thing is that in order to use the “peimg” command, the older WAIK for Vista is needed. The WAIK toolkit for Windows 7 does not contain peimg.exe. Microsoft replaced it for some file called DISM.exe but this does not do the same thing…. go figure……..
After these commands were issued the client could boot with F12 without halting, but instead of being captured by the WDS server (boot.wim-file?) it just went on installing Windows + drivers using the data I have just used creating the image to be captured (strange since there should be no such image yet???) but no step 6.3, no WDS GUI asking me for input. I tried one more time to run Sysprep on the client and rebooting it, but the above scenario just repeated one more time. If I overwrite my boot.wim-file, I will most definitely have the nic-problem again. So any idea on what I could do? Also another question; Using this guide, do you or don’t you need an answer file as well? The computers come with 4 partitions which I have deleted in the reference computer, creating 1 big partition, formatting it and installing the image on that partition. I made an answer file after reading a MS article on how to create one where number of drives, partitions etc are specified, but I don’t know how or when to use it. Thanks in advance and hope you have patience with my ignorance. Regarding the driver problem, what is the exact error you are having when you are trying to boot from the network? You should be able to boot using F12, but if there’s a missing driver, once the Windows PE loads into memory the PE will tell you that it cannot find the network driver. Hello Augusto and thanks for the answer. As for the missing driver this is the guide I have followed http://support.microsoft.com/kb/923834 and this specific issue has worked out well- i.e I can after having the driver put into the boot-(2).wim file boot the client with F12. However then the WDS does not capture the client. I spoke to a friend the other day and he told me that this image making can only be done with volume license – is that true? In that case that is probably my problem…. I will try one more time today now when I have the volume license installation CD. Right click Boot images, add Boot image -> used the boot.wim from the Windows 7 volume edition DVD. Added the network driver file to it with Imagex. Right clicked Install images, add Install Image -> used the install.wim from the Windows 7 volume edition DVD. Right clicked the boot file created in the first step (with the default name Microsoft Windows setup x64) and “Create Capture boot image”. It says “Extracting image from the source image file”. Now I sysprep my reference machine with drivers and applikacations installed, reboot, F12-ing it again, selecting the Microsoft Windows setup x64 and watching it contacting the WDS server, finding the boot.wim file. Now instead of seeing the WDS Image capture wizard, it wants me to logon to the domain and choosing the default install.wim made from the sources folder on the Win7 DVD………. Where do I go wrong? Please hope you can help..
I’m confused, when you clicked the option “Create Capture boot image” you’ve selected the Windows 7 WIM file? 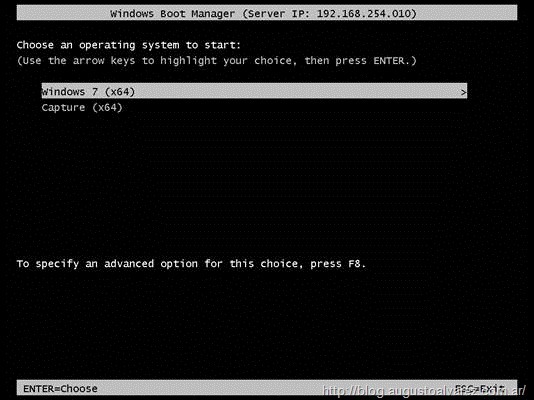 That is actually incorrect, you have to select the boot.wim from the Windows 7 media. And regarding the Windows 7, Volume License media has nothing to do with WDS. The VL media only accepts a certain type of product keys, but the installation files (install.wim and boot.wim) inside are the same used in any other type. No, in the Capture Boot image diagog I guessed I was supposed to create a new file, just give it a name? But actually I need to select the boot.wim again? Then I have boot.wim from the Windows 7 media twice, is that correct? Both as boot image and capture image? Ok, this time I select the same boot.wim from the DVD again, as a capture file, giving it the name Capture x64. The specified output file cannot be created. Please ensure that the folder exists and is writable. I was wondering if you might be able to give me some advice. Capturing and deploying images all go fine with me. Thep problem is that when i deploy an image, it seems that the system thats being imaged, automaticly joins the computer to the domain. I realy dont want that to happen. When i run the machine directly after having it sysprept localy, it doesnt go into the domain but when in capture it on wds and install a system connecting to the wds server, it always joins the domain. any ideas on what im doing wrong? Its a very basic answer file im using. It creates a random computer name and time/currency values. Did you try using the option in the answer file to join a workgroup instead? I have followed your but i can’t load the image in server after the sysprep. i can’t have Wds wizard in step ( 6.3 After this we’ll see the WDS wizard, select next). Did you create the “capture boot image” as shown above? That’s a different wizard. I have created the capture boot image and i still have the same problem. I can’t load the image after sysprep i have a windows 7 MSDN. Do you have the chance to see the “Capture Wizard”? Or do you see a normal Windows PE? Then there’s something wrong in the process. Do you have two boot images? One for deployment and one for capturing? When you boot from PXE, do you see both images? I get this error when regenerating my boot images for WDS for the x86 (Win XP SP3). “There was a problem opening the INF file. E:\DeploymentShare\Out-of-box Drivers\Net\bcmwl6_5.60.350.11_FDB2880178C71A6692BEB9027D8B6205992C5CDB\bcmwl6.inf Error: 0x80070002. No driver packages were found on the specified path. Verify that the driver .INF files are in the specified location and try the command again. DISM /Add-Driver failed, rc = 2. “Scanning directories for the count of INFs to import. Performing operation “import” on Target “Out-of-box drivers”. Warning: Driver Broadcom Net b57win32.inf 14.2.0.5 does not appear to support platform x64 as indicated. Overriding the indicated platform. Creating new item named Broadcom Net b57win32.inf 14.2.0.5 at DS001:\Out-of-Box Drivers. What is happening here? I’ve never seen this until upgrading to MDT 2010 Update 1. The drivers are being downloaded either from HP’s site or from Broadcom. Apparently, the driver is being seen as an 64 bit driver, but I’m only, to my knowledge importing an 32 bit driver. I know Broadcom is notorious for screwing with the INF’s and faulty or incomplete code. If you are going to use the same static image (OS + applications) for a determined period of time, then the best option is using WDS. If you have dynamic images that are changed constantly with new applications, and you need migrating profiles automatically, add drivers for specific hardware models, then probably the best option is MDT. I get this error whne trying to boot to the PXE image. any one help me to solve this problem ? When exactly are you receiving the error? i want to know how to deploy applications, after deploying os image using wds. and how can i add drivers packages in wds console. 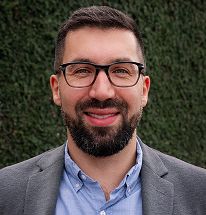 Pingback: Windows Deployment Services–adding drivers to boot.wim « Microsoft « ..:: www.christiano.ch //::..
Could you please tell me why do you add the install.wim to the system? It seemes you are not using it because you are creating a sysprep image. Isn’t it possible to script the installation of the install.wim file? Yes, I’m just adding the clean Windows 7 image from the installation media to make an example. And yes, you can also associate the unattended files to the clean install.wim file and it will apply as well; with that you will have a clean and unattended Windows 7 installation without any prior capture. But again, this image has no customization and no applications added. ah it was just an example. ok.
I’m trying to get a full unattended file because we have serveral hardwaretypes here. As far as I understud it is quite simple to add patches and aplications to the wim using dism. I did this already for a standalone image. For all the other software we are using GPOs. Yes, it is possible to capture an image without sysprep. 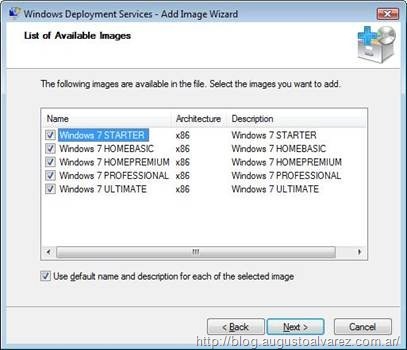 You need to use ImageX tool and create a Windows PE bootable image with this tool inserted. It is not recommended at all. Using images without “sysprep” is not a supported scenario in any type of deployment. I want to explain something which I really need. In my environment I need to make sure windows is up to date for my all 100 machines. So I used to update the image and then deploy. There’s no limit in sysprep tries you can use in the same image, so that shouldn’t be a problem. Did you receive any particular error running sysprep? I have setup win2008 server with AD DC,DNS and DHCP. a have a separate win2008 server which is also member of domain, i have successfully setup wds on it. But when i tried to network boot a pc, error below encountered. pxe-e55 proxydhcp service did not reply to request port 4011. It seems that it gives an ip address from dhcp but did not detected my wds server. Please please help me on my problem. hoping for your soon responce. Sorry for the delay. That error could appear for several reasons. Server and client are on the same network? There’s no DHCP relay in the middle? What’s the procedure did you use to configure your WDS server? Hey thanks for the guide first of all. Now i want to add the Windows 7 image but i keep getting the old F12 boot OS chooser ? becuease its already working i cant upload an image to it. 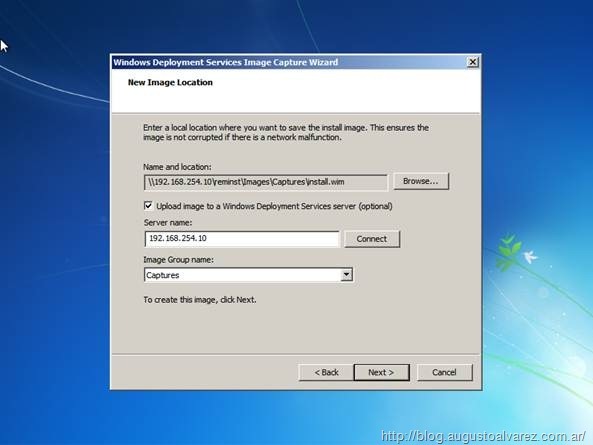 Did you add a Win PE image from Windows 7 to capture an image? Did you try using the Windows 7 media to add an installation image from that media? This is a really good and thorough tutorial for a tool that is time consuming to setup and learn. You’ve certainly mastered this process. My question is, how long does it take you to go from setup to full deployment? It just seems like all the costs savings of using a free tool like WDS or MDT is quickly eaten by the labor costs associated with using the tool. For those not as savvy as you, I would imagine they could spend 3-4 times as long as you to accomplish the same task. I used to always pride myself on being able to “figure out” the free tools but have realized that spending a couple thousands dollars up front can really save money in the long run. Anyway, I’m now using http://www.smartdeploy.com for all of our Windows migration and deployment. Not only is it extremely straight forward, but all the driver packages are already created by SmartDeploy so there’s no need to waste time managing drivers. I just go straight to their site and download them. I’d be curious to hear what you think of the tool and if I’m missing out by not going the WDS route. I have configured WDS on windows server 2003 sp2,I have downloaded the windows 7 waik tool for gui based deployement & captured both boot.wim & install.wim from windows 7 DVD,but when i am deploying windows 7 on a desktop it has become very slow (i.e 1% is completed in 5min).Can you tell me the reason behind this slow deployement? Well that could be for several reasons, can you give me more information about the connection used in the client-server? Is the WDS server with other role/service that could be disrupted with the network connection? I am deploying windows 7 & through wds having windows server 2003 sp2,but after the put my credentials,installation is taking very long (i.e 1% is completed in 5 min). on windows server 2003 sp2? Actually I’ve never tried this option before. Did you check the windows client log to see if there’s any error? You can find the client log in C:\Windows\Panther\Setupact.log (and setuperr.log if it’s not empty). 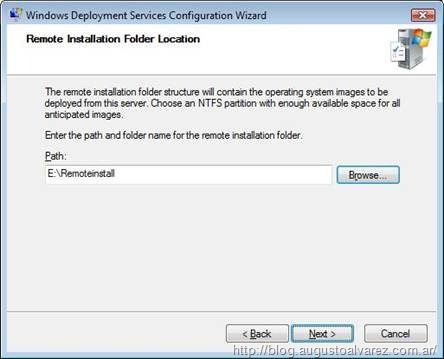 Hi I have followed this steps, when im deploying it to bare metal machine it will reach until windows PE prompt only. It didnt install the image. That’s strange, what’s the procedure used for uploading the boot and install image into WDS? Did you modified the boot.wim file? Your reference image has run out of sysprep tries? Do you have an error message showing? Microsoft does not include any limit in running sysprep in the same image. i am trying to follow your tutorial and got as far as capturing the boot image 4.3, then stuck. 1 file & Wds server also in server 2008 R2 with a NTFS drive for storing images..
after i have reached step 4.3, i am trying to create a windows 7 machine in my VMware host, f12 finds my DHCP and says contacting or connecting WDS server 192.168.1.7 ……………..
the trail of …… just keeps increasing without going anywhere. . If i have already captured an image using sysprep + o&o disk imaging, can i use that image to import a previously captured image? Regarding booting from PXE, the problem must be regarding the WDS + DHCP configuration or a connectivity issue. After the several “…” you must see an error showing, which one is it? For the second question, yes, you can use any image created as long as the image was created using sysprep in a supported method. I have seen your info its very useful for me. and i need one more help frm you. in my Org we are using WDS with MDT2010. we are using different model desktop and laptops and both having different drivers and applications. if i install windows 7 it should automatically push the appropritate drivers and application to proper laptop.is it possible. i heard it’s possible through Database options in MDT. Can u please advice on this. Getting Not Enough Disk Space error 2147467259 when running LiteTouch.VBS from W7 Client and execute the Sysprep and Caoture Task from Task Sequence. It seems that WinPE is trying to copy WIM file to the System reserved partition (100 MB or so..). Tried on VM, tried on clean install – same error. Looks like a very common error too! Any suggestions would go a long way to my W7 Deplmnt. Can you copy/paste the exact error showing in the log file? Can anyone tell me whether it is possible to mount the .tib file in wds for network boot purpose. and i have created a OS image with .tib extension so please someone suggest me whether it is possible to use this. If you are using “WORKGROUP”, you need to create a user using the unattended file in order to be able to login. Otherwise you will need to add it to the domain and enter domain credentials. Is it possible to create an unattended deployment with just an Windows7 image from the Windows DVD and an WDSanser file. Or is an capture form a referring installation required? No, you don’t need to capture it, you can use the Windows 7 media file. I keep getting only a Volume D: for your step # 6.4. I am studying for the 70-643, and reviewed over and over but still I do not see a C: volume. The Windows 7 syspreped image was on the C: drive and both the WDS server and image are on VMs. Sorry for the delay on this. That error is actually quite common in WDS scenario, since the C:\ drive is used by the WindowsPE it shows your original C:\ as a D:\ drive. You can still capture it normally and the image will be valid. Great tutorial however i’m having an issue at running the capture section. I completed the first steps no problem and i made an image and to test everything was working at that stage i ran a PXE boot and installed windows with no issues. I then tried to create the capture section which created fine and the sysprep ran on the machine with no issues however the machine now gets a DHCP address from the DHCP server however no options are given at stage 6.2 it simply returns a pxe-e55 proxydhcp service did not reply to request port 4011 and quits the program. I have made no changes to the WDS other than adding the new boot image since it worked. I am a bit confused as to what has happened. Any ideas or help would be appreciated !!!! Ok so i solved this myself. There is a lot of information around on this however all of it was useless and didn’t work for me. So i decided to completely remove WDS from the server and delete the image files i had created. Reloaded WDS and recreated the image files and it worked second time around. Glad to know you’ve managed to solve it. There are some times that some of the WDS system files gets corrupted and start generating this error; or a misconfiguration in the Settings. Whenever I saw that problem the image used had corrupted files. Did you try using a different media to import the boot and install wim file? Ok it seems that my image got saved to the root of C: drive on the computer that I was imaging. Why did it not get uploaded to the server? I have manually moved my captured image to the server now how do I associate it with my Win 7 boot image? when i add the file instll.wim in wds .i found this error ,cannont find the specific path. Hi i am thulasi raman from india your tutorial very nice i have one doubt.what is windows 7 deployment?.deployment is installed OS from server its correct or not?,I have tried install ads,dhcp,wds and configure windows 7 deployment.After deployment i will give username,date time and everything but all the old software is available in that machine so please tell me what purpose we need to use WDS? I just managed to read this nice article searching for a suitable solution to my problem. We have a non-active directory environment where we need to install windows 8 + other applications like ms office etc on about 100 workstations for various users. Can we do a fresh install of windows 8 and other applications on one workstation and make an Image of it and deploy that Image to several other workstations , the easiest way possible. We don’t want to do the same installation again and again on each workstation, so that we can save our time and quickly finish the process too. Can you suggest some suitable idea for us. Your helpful ideas are highly appreciated.. Without Active Directory I would say that is going to be a little bit difficult. You can generate on your own a customized Windows 8 installation with all the apps, but you will still need a USB drive or DVD media to deploy on every machine. I would recommend using WDS in a virtual machine (you can also have a dummy Active Directory just for installing WDS), prepare an image and the upload it to the server. 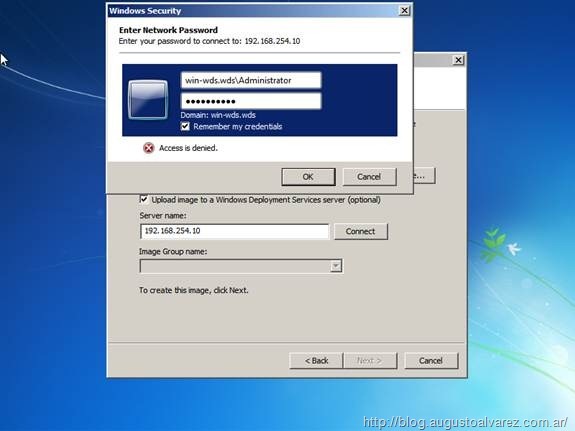 Then you can deploy the image to all workstations without joining to the domain. Is there a way to deploy images using WDS where the machine in question is NOT on a domain? There are alternatives to review using DHCP options and other PXE servers to boot machines from the network, but those steps are not as easy as to deploy WDS. When I’m deploying an image the computer name is not being changed; it stays the same as it was before I performed the deployment. Can you suggest anything i should check. Can you copy/paste the XMS section where you have assigned the * for the random computer name? Thanks for your reply Augusto. I’m afraid there was a very simple answer to my problem; I was not deleting the computer account in Active Directory. When I did so the computer was named according to the format I defined. What’s the process you are using to add drivers to that boot image? I was using WDS to deploy window 7 image. We will install microsoft office 2013 before sysprep the image. I’ve seen the error before, it was related to a corrupt image file. If the process works with a WIM file from the Windows DVD, then there’s nothing wrong with the server. I would recommend re creating the image. The error can be a number of things. The install.wim from DVD/ISO Windows file or a captured image? If its a DVD/ISO file, I would validate using a separate media or downloading again the ISO file. I would avoid mounting the ISO from the network or extracting it from a network share. Captured images can be corrupted by several reasons within the capture process, the read/write of the WIM file can have some errors if you are trying to write on a network share for example.